It appears Royal Caribbean will cease offering DreamWorks programming on its ships for sailings that depart on or after April 1, 2019. 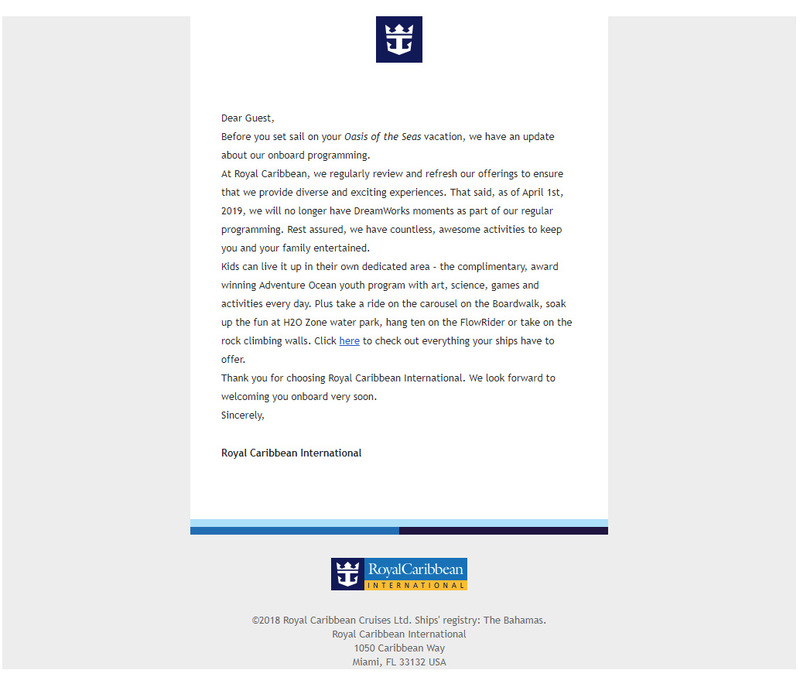 Royal Caribbean sent guests on select sailings an update about the ship's programming to inform them of the change. 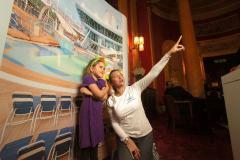 The cruise line reiterated their commitment to offering plenty of family programming to its guests. All sailings that depart before April 1 will have the program for the entire sailing. The only exception to this end date is the DreamWorks ice skating show onboard Allure of the Seas. Due to a previously scheduled cast rotation, the last Allure sailing featuring the DreamWorks show will be the March 17, 2019 sail date. After that sailing, Allure will feature a new ice show by Royal Caribbean Productions team. There are nine Royal Caribbean ships that offer the DreamWorks Experience onboard, which include activities such as character meet and greets, Adventure Ocean programming, films and character breakfasts. Royal Caribbean said the decision was made as part of its regular process of reviewing and refreshing their onboard offerings. The DreamWorks ice skating show and DreamWorks AquaTheater show on Allure of the Seas will be replaced with family-friendly shows designed by Royal Caribbean Productions. The sail away party and Royal Promenade parade, on select ships, will be replaced with original parties and programming. Symphony of the Seas was the first new Royal Caribbean ship since the partnership began with DreamWorks in June 2010 not to debut with the DreamWorks Experience onboard. 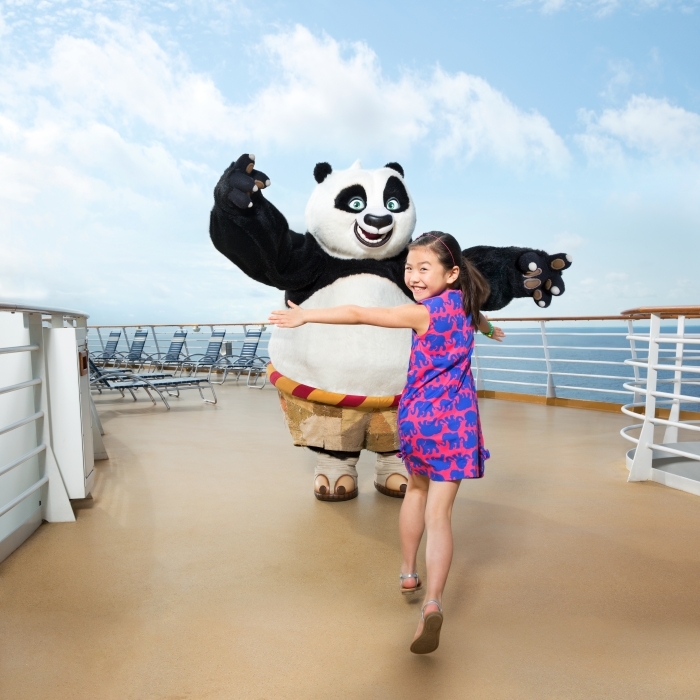 In lieu of the DreamWorks offerings, Royal Caribbean created its own brand of family entertainment activities to maintain its family programming options. Royal Caribbean's newest cruise ship, Symphony of the Seas will not offer the DreamWorks Experience onboard when it launches in 2018. Royal Caribbean confirmed via Twitter that its fourth Oasis class ship will not have the DreamWorks characters or events onboard, which is a departure from the other three Oasis class ships. The partnership with DreamWorks Entertainment allows Royal Caribbean to offer character meet and greets, parades, shows, television programming and more. Symphony of the Seas will be the first newly constructed Royal Caribbean ship since Allure of the Seas not to offer the DreamWorks Experience. Royal Caribbean announced today that one of its newest ships, Harmony of the Seas, will feature the DreamWorks Experience, all-new Adventure Ocean youth programming and new family amenities. Harmony of the Seas will offer guests the DreamWorks Experience that other ships in the fleet have offered and many guests have come to enjoy. 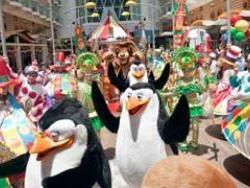 DreamWorks Animation characters including Po of Kung Fu Panda; Shrek, Fiona and Puss in Boots of Shrek; and from Madagascar, Alex the Lion, Gloria the Hippo, King Julien and the Penguins will be available for guests to meet during their cruise. In addition, guests will have guaranteed seats on “opening weekend” of highly anticipated feature films such as "Kung Fu Panda 3,” which premieres onboard the same day it does in theaters on land. Year-round, guests can watch the latest and long-term favorite DreamWorks Animation films in the ship’s 3D movie theater and on a dedicated DreamWorks TV channel in their stateroom. New to be offered in Harmony’s Adventure Ocean Theater is Away We Go!, a black light puppet show created by Tony award-nominated actors and imaginative producers John Tartaglia by and Michael Shawn Lewis of Gable Grove Productions. Additionally, programming by “Muffalo Potato” – the popular YouTube show, which teaches kids to draw anything in minutes using only letters and numbers – will round out Harmony’s lineup. Muffalo Potato originally debuted aboard Anthem of the Seas and will expand fleetwide just in time for summer vacations, starting with Harmony of the Seas. Starting in November 2016, Central Park and Boardwalk balcony staterooms will receive additional ammenities. Special perks in the Casino Royale. Private time on the cruise line’s iconic 38-foot tall rock wall. Royal Caribbean announced today that Anthem of the Seas will offer the DreamWorks Experience, which offers family friendly activities and entertainment centered around famous characters from the DreamWorks catalog of films. activities, games and adventures rooted in the popular DreamWorks Animation films at Adventue Ocean. guests can watch the latest DreamWorks Animation films at the ship’s movie theater or on a dedicated DreamWorks TV channel in their stateroom. The DreamWorks Experience will begin being offered on Anthem of the Seas when she begins sailing from her homeport of Cape Liberty Cruise Port in Bayonne, NJ. Starting September 1, 2014 Royal Caribbean will add a $10.00 per person cover charge to all guests six years and older for its DreamWorls Character Breakfast. The DreamWorks Character Breakfast is offered on Royal Caribbean ships that have the DreamWorks Experience, including Oasis of the Seas, Allure of the Seas, Freedom of the Seas, Liberty of the Seas, Voyager of the Seas and Mariner of the Seas. The character breakfast had been complimentary for all ages until now but the change goes into effect starting on sailings that depart on or after September 1, 2014. It features characters from Shrek, Kung Fu Panda and Madagascar during a special breakfast event. There are no changes to the breakfast event other than the cover charge for those six years old and older. The change could be to help ease crowding with this popular event. Reservations are recommendaed and may be made online in the Pre Trip Planner or onboard your ship. Royal Caribbean announced today that it is expanding its relationship with DreamWorks Animation to include the DreamWorks Experience to a sixth-ship, Mariner of the Seas in May 2013. Royal Caribbean first formed a partnership with DreamWorks in November 2010 to bring their characters to Royal Caribbean's ships. These include Oasis of the Seas, Allure of the Seas, Freedom of the Seas, Liberty of the Seas and recently Voyager of the Seas. The DreamWorks Experience offers passengers parades, themed activities and events based on DreamWorks Animation’s popular feature-film characters, including Po of “Kung Fu Panda;” Shrek, Fiona and Puss In Boots of “Shrek;” and Alex the Lion, Gloria the Hippo, and the Penguins from “Madagascar.” Each ship also is equipped with a 3-D movie theater playing the latest DreamWorks Animation films. Royal Caribbean has contracted Circle Agency to design and manage a new experiential marketing campaign that aims to promote the cruise line's onboard partnership with DreamWorks Animation. The new campaign kicks off at the Shrek the Musical theater in Dury Lane, London and offers theater goers the opportunity to have an exclusive photo taken that drops them into a scene onboard a Royal Caribbean ship. In addition, representatives from Circle Agency will be on hand to encourage customers to share their image via Facebook, or email it to themselves. People that participate in the campaign will also be entered to win a free Royal Caribbean Mediterranean cruise for four aboard Liberty of the Seas. The marketing campaignis scheduled to run during every matinee and evening performance until November 3rd. Royal Caribbean Launches & Events Senior Executive Hannah Simpson commented on the new promotion, "The Dreamworks partnership is now going into its third year and continues to add to our already extensive family offering onboard our ships. We wanted to highlight the various experiences available for families onboard. 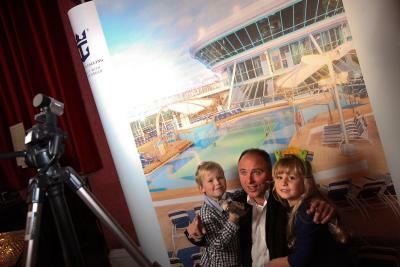 Voyager of the Seas became the fifth ship in Royal Caribbean's fleet to offer the Dreamworks Experience onboard. Characters from “Madagascar”, “Shrek”, “Kung Fu Panda” and “Puss in Boots” will be available to guests to meet and see. Voyager joins Oasis of the Seas, Allure of the Seas, Freedom of the Seas and Liberty of the Seas as the ships that offer the Dreamworks package. The ship, which offers itineraries of four to fourteen nights out of Shanghai and Beijing, will now offer special entertainment options to its passengers such as parades, character breakfasts in the main dining room or surprise encounters with the characters. Royal Caribbean CEO Adam Goldstein commented on the addition, "Extending the DreamWorks Experience to Voyager of the Seas illustrates, even more, our commitment to the Chinese market and the regions of Asia and Australia." Voyager of the Seas passengers will also be able to watch 3D movies like "Puss in Boots" or the latest film from the Dreamworks, Madagascar 3: Lost in Europe. After China, where the ship will be until October, Voyager of the Seas will operate on the Australian mainland, in November, departing from Sydney, performing routes from eight to 18 nights in Australia and New Zealand.